Doncaster is most famous as the home of the world’s oldest Classic, the Ladbrokes St Leger, on the Flat but the racecourse is also a traditional bastion of National Hunt racing. Many of jump racing’s greats have graced Town Moor in the winter months, notably Sea Pigeon, Night Nurse, Mandarin, Mill House, Gaye Brief and Bregawn. Red Rum, three-time winner of the Grand National in 1973, 1974 and 1976, was no stranger to Doncaster either. The greatest Grand National winner ever won a seller on the Flat first time out as a three-year-old in March, 1968, at Doncaster and, having made three starts over hurdles at the course, he opened his chasing account in the Town Moor Novices’ Chase in November, 1970. The course’s National Hunt racing roots are entrenched in the old Doncaster Hunt Meetings of the 1820s. Jump racing declined and disappeared in the early part of the 20th century but returned for good in December, 1946, to make Doncaster the only Classic course in England to cater for the sport’s winter warriors. Doncaster Racecourse’s 2008/2009 jump season kicks off with the two-day Christmas Meeting on Friday, December 12, and Saturday, December 13. This year marks the return of the popular meeting, which was last staged in 2005, prior to Doncaster’s fantastic £34-million redevelopment. Last season’s intended meeting was a casualty of frost. Saturday features the three-mile BETDAQ The Betting Exchange Handicap Chase worth £40,000. Town Moor’s jump racing revival started in 1946 and two years later the racecourse inaugurated the Great Yorkshire Chase, which soon became established as one of the top staying handicaps of the season. The great Mandarin was fourth to Chavara in 1961, while Mill House gallantly shouldered 12st 3lb when third to Spear Fir in 1967. Now known as the Sky Bet Chase, the three-mile race has been won by plenty of famous names such as the Grand National winners Freebooter (1950), E.S.B. (1957) and Nicolaus Silver (1962). Charlie Potheen was triumphant in 1973 before winning the Whitbread Gold Cup at Sandown. Bregawn prevailed under John Francome in 1982 and went on to lead home trainer Michael Dickinson’s famous five in the 1983 Cheltenham Gold Cup. This season’s running of the Sky Bet Chase is on January 24 and worth £85,000, an increase of £10,000 on last year’s value. The race continues to attract good horses. Last year’s victor An Accordion, trained by David Pipe, defeated Grade One winner Ungaro in a thrilling finish and proceeded to be successful at the Cheltenham Festival in March. Sky Bet Chase day is Doncaster’s biggest jump raceday of the year and also features the Grade Two Albert Bartlett Novices’ Hurdle, known historically as the River Don Novices’ Hurdle. Battlecry vanquished his rivals last season when taking the extended three-mile contest in impressive fashion. Nigel Twiston-Davies’ charge ran on strongly to win by two lengths from Coe. With prize money of £30,000, the contest is an attractive proposition for staying novice hurdlers being aimed towards the Albert Bartlett Novices’ Hurdle at the Cheltenham Festival in March. Racegoers love to support a good mare and last season’s running of the £50,000 Doncaster Mares’ Hurdle rewarded them with the sight of a suitably high-class heroine. The Nicky Henderson-trained Chomba Womba battled gamely to hold the challenge of Theatre Girl and score by three quarters of a length in the extended two-mile contest. Chomba Womba has been in cracking form this season, winning the Grade Two Elite Hurdle at Wincanton and defeating Crack Away Jack in the Grade Two Ascot Hurdle. The eight-year-old could yet attempt to become the first mare to win the Champion Hurdle at Cheltenham since Flakey Dove, herself victorious in a handicap hurdle on Town Moor in 1992, two years before her greatest triumph. The most lucrative prize of Doncaster’s 2008/09 season is the £100,000 williamhill.co.uk Handicap Chase. The race, run over two miles and half a furlong, was staged for the first time in 2008. Howle Hill, trained by Alan King, chased down the Howard Johnson-trained Lennon to score by a neck in a thrilling finish. The race was suggested by the British Horseracing Authority which was keen to introduce a replacement handicap chase when the Victor Chandler Chase at Ascot became a conditions event. There are two valuable supporting races that day, the £35,000 Get Your Chips @ williamhillcasino.com Handicap Hurdle over nearly two and a half miles and the £30,000 the Try And Bluff Me @ williamhillpoker.com Handicap Chase over four miles. Doncaster has a great tradition as a stepping-stone for horses bidding to clinch Grand National glory and last season was no exception. Donald McCain, whose father Ginger trained the great Red Rum, saddled Cloudy Lane to win the Coolfun Ltd Grimthorpe Chase by seven lengths from Ungaro. The gelding’s triumph in the three and a quarter mile handicap chase propelled him to 7/1 joint-favouritism for the Aintree spectacular in which he crossed the line sixth behind Comply Or Die. The 2005 renewal of the Grimthorpe Chase, then a three-mile contest, went to Run For Paddy who landed a famous victory in the following year’s Scottish Grand National. This year’s race has a prize fund of £50,000. Many of the stars of the jump scene cut their teeth in National Hunt Flat races, otherwise known as Bumpers. The contests provide invaluable competitive racecourse experience for young jumping prospects. In recent times, these races have enjoyed a higher profile with National Hunt Flat races at Cheltenham and Punchestown holding Grade One status. The DBS Spring Sales Bumper is one of the most valuable of its type with a purse of £50,000 and provides a lucrative springboard to both those championship contests as well as the Grade Two Bumper at Aintree. The 2007/2008 season brought plenty of household names to Doncaster with no fewer than four future Cheltenham Festival winners showcasing their credentials on Town Moor. The aforementioned An Accordion led the way with his Sky Bet Chase victory augmented by success in the William Hill Trophy Chase. Tidal Bay was the undisputed rising star of the northern racing scene last term. Howard Johnson’s charge won five of his six starts in novice chases, taking the Grade One Arkle Chase at the Cheltenham Festival and adding the Grade One John Smith’s Maghull Novices’ Chase at Aintree in April. In fact, the gelding’s only reversal came at Doncaster in the Watch & Bet - Bet Live @ williamhill.co.uk Novices’ Chase in February, when Leslingtaylor defeated the odds-on favourite by a neck. 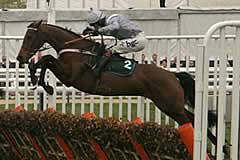 Celestial Halo was another to taste defeat at Doncaster and then follow-up with Cheltenham Festival glory. The son of Galileo made his first visit to Town Moor in September, 2007, when he lined up in the Group One St Leger itself. Having finished a creditable seventh, Celestial Halo joined champion jump trainer Paul Nicholls’ yard. A debut success at Newbury was followed by defeat at Doncaster in February, the gelding finishing second to Sentry Duty in division two of the Every Minute, Every Match - Betlive @ williamhill.co.uk Novices’ Hurdle. Celestial Halo stepped up on that effort when a game victor of the Grade One JCB Triumph Hurdle in March. Whiteoak enjoyed a fantastic season under the care of Donald McCain. After a victory at Bangor-On-Dee in December, the mare stepped up in class for the Grade Two Rossington Main Novices’ Hurdle at Doncaster on January 26. McCain’s charge ran a blinder at 25/1 as she went down by short-head to Tazbar. Whiteoak then enjoyed a smooth win at Ascot before heading to Cheltenham for the Grade Two David Nicholson Mares’ Hurdle in which she rallied gamely to win by a short-head at odds of 20/1. “I think that they have done a marvellous job with the course at Doncaster. The steeplechase fences have been changed slightly and they seem to jump very well. They are a decent size and horses really enjoy jumping round there. Everything done to the course after the redevelopment seems excellent. It’s a very fair track and the ground always seems to be better than anywhere else in mid-winter, with a good drainage system in place. It has been a lucky track for us over the years. “We had a nice season at Doncaster last year with Tazbar’s victory in the Rossington Main being the obvious highlight. My mother won the Sky Bet Chase twice with Dalkey Sound and Carbisdale, while I was unlucky myself with Ungaro in the same race last season. “Doncaster has done a great job not only with promoting the established races but also in creating new contests, like the williamhill.co.uk Handicap Chase, which already looks like a good addition to the calendar. “It was great to win with Leslingtaylor at Doncaster last season, especially beating a horse of the calibre of Tidal Bay. I have always thought Doncaster was a great course to have runners at but it seems even better since they’ve redeveloped it. You need a horse that can jump well to get round Doncaster. The fences seem as big as ever and you need to be at your best to run well there, but it’s a very fair track. “The fences last season were lovely and all of the groundstaff did a great job with them. They were shaped properly and the horses seemed to enjoy going over them. “It is the same as other good tracks in that you need a horse who is a good jumper to get round - if a horse can jump, then you can have a really good ride round Doncaster. “Since the redevelopment, all of the fences have been replaced. They are all still portable obstacles, but we took the opportunity to move three of them to counter the build-up of material over the years and we also changed some of the take-offs and landings. “We’ve also put leylandii and spruce on them and dressed them up to above the middle rail as well to make the horses stand off from them a bit.